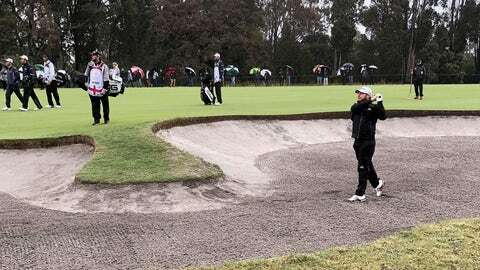 MELBOURNE, Australia (AP) — Ducks waded through standing water on fairways. Some bunkers flooded. Golfers put waterproof winter mittens on between shots. England’s Tyrrell Hatton angrily smashed the tee marker on the 10th hole after his shot went into the woods. He and his partner, Ian Poulter, bogeyed the hole. Poulter wondered if play should have been stopped, saying it was “questionable” if the course had become unplayable. Gavin Green of Malaysia, also two strokes behind with partner Ben Leong, said he’d gladly take his team’s 73. Marc Leishman, who described the conditions as “brutal,” grew up in Victoria state not far from Melbourne. Zimbabwe’s Scott Vincent and Benjamin Follett-Smith were among those six teams, and it didn’t get any better for them. They finished with 84. But that wasn’t the worst score of the day of the 28 countries. Alexander Tranacher and Peter Karmis of Greece combined to shoot 87, including three triple-bogey 7s. The last word on the terrible day belongs to a guy tied for first, Belgium’s Thomas Detry.